or "Why I love Anthony Esolen"
or "Why I think intelligent Christians should read Touchstone or at least the blog"
We drove down to Kentucky Friday evening for my brother's college graduation. We drove along I-57 after what the National Weather Service described as an "inland hurricane" tore across Illinois. My parents, who drove down ahead of us, were stopped on the interstate as crews cleared trees that had blown across the road. We came through in the dark, so we didn't see the damage that surrounded us, but we heard about iton the radio stations. Passing through Marion was remarkable because, except for a few lights atop the hospital, the town was completely black. Several of our congregations in that area were affected, as well as countless others. Keep them in your prayers. 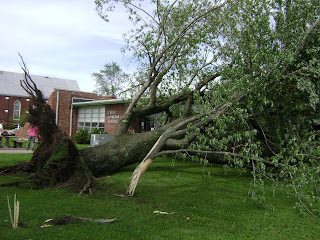 They say it was an “inland hurricane” that swept through Southern Illinois. One individual, a member of Immanuel, Murphysboro, was killed by the storm when a tree fell through his house. Please pray for Pastor Mayes and the members of Immanuel as they mourn this loss. We had some property damage in Murphysboro, Marion, and Carbondale, but by far the greatest damage to property was at Christ, Jacob. Attached are a couple of pictures of the school at Jacob. 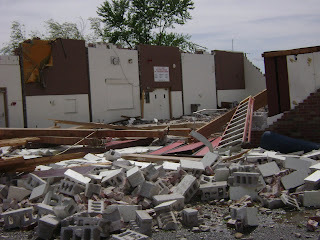 As you can see, the gymnasium was totally destroyed and a tree fell on the school itself. No one was hurt, God be praised, at Jacob, since they had been listening to the weather radio and had all the children and teachers huddled in an inner room when the storm struck their building. Please raise a prayer of thanksgiving to the Lord and ask His further protection and blessing for all those affected. You will hear more from us soon. Some insight from Fr. Hollywood on the popular denigration of motherhood. Some of you asked to see a picture of Dean in his tux that his grandmother bought him for his aunt's wedding. Well, here he is.